At the urging of Professor Jean Coppola, Marc Kowtko, BS/IT ’15, wrote and submitted “Securing our Nation and Protecting Privacy” for possible presentation at the IEEE – Long Island Systems Applications and Technology Conference scheduled in early May. Much to his astonishment, the paper was accepted, a rare feat for a college freshman! In addition, Marc received a Library Excellence in Research Award for his paper, one of several such awards given annually by the Pace University Library. 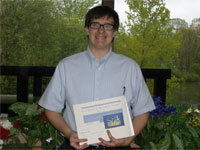 Marc Kowtko, BS/IT ’15, had an unusually busy and rewarding freshman year. Knowing that his interests lie in the field of security and information assurance, Marc chose to come to Pace as a BS/IT major in order to pursue a concentration in that area. When Professor Jean Coppola suggested that he submit a paper for consideration for the upcoming IEEE Long Island Systems Applications and Technology (LISAT) Conference, he seized the opportunity not only to enhance his security knowledge but also to hone his research skills. At first he was required to write a 300-500 word abstract, an overview of his proposed paper. When it was accepted, he “was astonished.” In early March he was notified that the full paper – “Securing our Nation and Protecting our Privacy” – had been accepted for presentation at the LISAT Conference to be held at SUNY – Farmingdale on May 6. Marc made his presentation and the paper was published in the conference proceedings – an impressive feat for a college freshman! Marc is sold on the idea of a career in security and information assurance. He plans to apply for both a Department of Defense Information Assurance Scholarship and a National Science Foundation Scholarship for Service for his junior and senior years. These scholarships would cover tuition for his last two years of college and provide him with opportunities for internships with governmental agencies and the likelihood of employment upon graduation. In addition, Marc, along with seven other Seidenberg students, participated in the 2011 Northeast Collegiate Cyber Defense Competition sponsored by EMC and held outside of Boston in early March. He also served as a referee at the FIRST Tech Challenge Robotics Tournament held on Pace’s Pleasantville campus in January. Marc also received the honor of being inducted into the Dyson Society of Fellows. As a freshman, it is rare! We are very proud of our son Marc’s great accomplishments in his first year at Pace. He worked really hard but he couldn’t have done it without the GREAT professors and staff. In particular, Professors Jean Coppola and Li-Chiou Chen and Ms. Susan Maxam. Thank you. Congratulations, Marc! The recognition you have received is well deserved.